Many motorhomers are heading for some winter sun and escaping the British winter in their leisure vehicle according to our latest poll results. In contrast, caravanners will either continue to use their tourer in the UK this winter or will be laying their ‘van up during the colder months. In our last poll we asked if you’d be escaping the British winter in your motorhome or caravan. A third of voters said they would be be escaping the British winter in their motorhome, compared to just eight per cent of caravanners. But a further 23 per cent of motorhomers said they would also brave the British weather and would be continuing to use their ‘van in the UK. Only seven per cent said their motorhome would be put into storage for winter, proving that many owners take advantage of the freedom of motorhome ownership and use their vehicle all-year round. 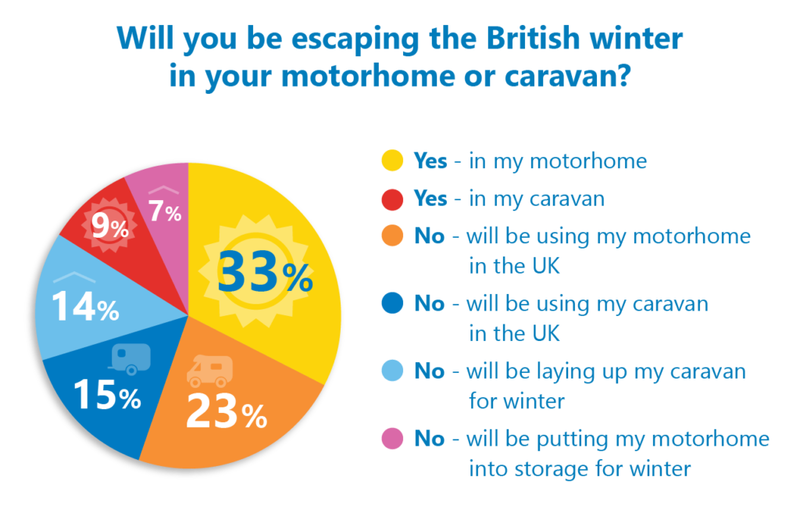 15 per cent of voters said they would be using their caravan in the UK this winter, with a further 14 per cent saying they would be laying up their caravan for winter. You can read more about our hot tips for winter touring here or if the you’d rather be heading to warmer climes here’s our article on chasing the winter sun in your caravan or motorhome. Thanks to everyone who voted and let us know what you make of the results in the comments box below. And we’d love to hear about your winter touring trips – in the UK or abroad.